Glass blowing artisans may use modernized tools today, but the essence of working with glass remains an ancient art. The technique can be traced back to 3500 BC in Mesopotamia (today’s Iraq). The basic raw materials are sand, sodium carbonate and sodium nitrate which are mixed together then fused in a very hot kiln. Molten red-hot liquid glass transformed into a lasting artifact is an act that requires a creative mind, dexterous hand work, and stamina. Physically draining, glassblowing is one of the earliest forms of handcrafting. In the past, glass blowers were literally held hostage for fear of their knowledge being leaked. During the 1st Century A.D., Phoenician glassworkers were forbidden from traveling, although those who escaped spread the art form into present day Switzerland, France, and Belgium. Similarly, for Venetian glassblowers leaving the island of Murano was a crime, punishable by death. By the 15th century, Venice was the principle glass producer of Europe with a concentration of 3000 glassblowers in a single location, the island of Murano. Mille (thousand) and Fiori (flowers). The millefiori technique involves the production of glass canes or rods, known as murrine with multicolored patterns which are viewable only from the cut ends of the cane. A murrine rod is heated in a furnace and pulled until thin while still maintaining the cross section’s design. It is then cut into beads or discs then cooled. The murrine are then cleaned up and arranged in a desired pattern within a special heat-resistant mold to give the product the necessary shape. The mold containing the murrine pattern is placed into the special furnace. These furnaces are the cornerstone of the glassmaking craft, as the artisans use them to heat up the glass mixture and work it while it's in a liquid state. Once murrine start bonding with each other inside the furnace, the mold is removed and its contents are pressed upon to create a continuous Millefiori surface with no gaps. The final product is shaped once out of the furnace. 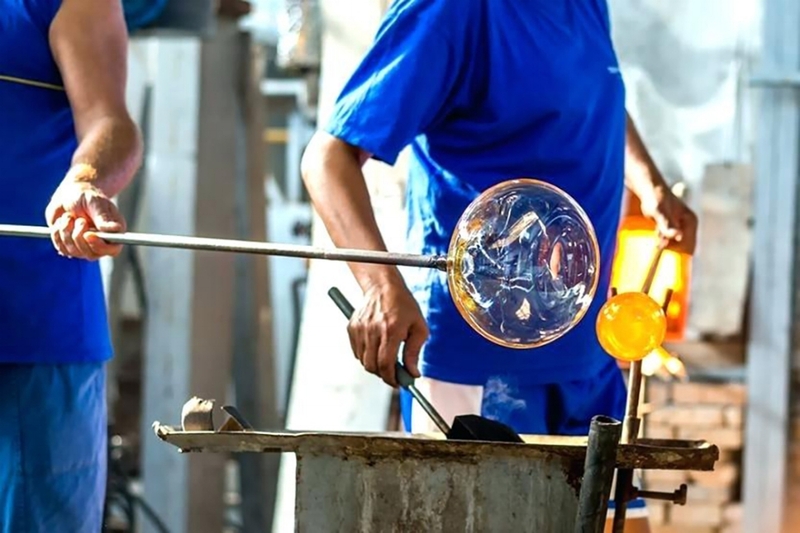 One of the prestigious glass blowing companies in Venice today, is Ercole Moretti. Established in Murano in 1911 by the three Moretti brothers, Ercole, Norberto and Iginio, for the production of traditional glass beads, the classical “Chevron”, and the “Millefiori” mosaic. The company still runs today under the management of the sons and grandchildren of the three original founders. Their name stands out thanks to their mille fiori bead production and their well executed unmistakable velvety signature finish. Each piece is handmade and great pride is taken in the high quality of the plates, bowls, necklaces and accessories produced. Three qualities are essential to achieve such a high quality result, aside the skilled workmanship, these are deep knowledge of the craft, utmost precision and no compromise. Undeniably, twenty-first century Murano glass continues to be as sought after as in the past. It has become a cult object for the glass lovers and collectors of the world.